[counts,binLocations] = imhist(I) calculates the histogram for the grayscale image I. The imhist function returns the histogram counts in counts and the bin locations in binLocations. The number of bins in the histogram is determined by the image type. You optionally can compute the histogram counts and bin locations using a GPU (requires Parallel Computing Toolbox™). For more information, see Image Processing on a GPU. [counts,binLocations] = imhist(I,n) specifies the number of bins, n, used to calculate the histogram. [counts,binLocations] = imhist(X,map) calculates the histogram for the indexed image X with colormap map. The histogram has one bin for each entry in the colormap. This syntax is not supported on a GPU. 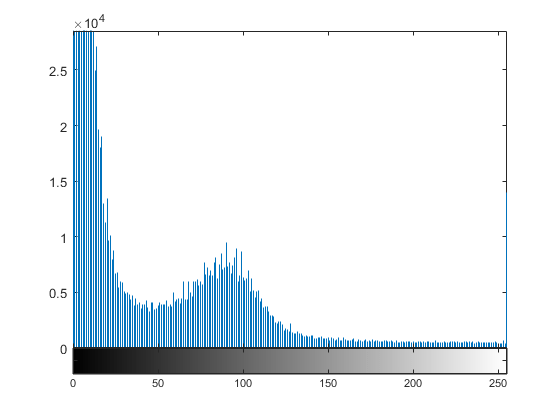 imhist(___) displays a plot of the histogram. If the input image is an indexed image, then the histogram shows the distribution of pixel values above a colorbar of the colormap map. If you use this syntax when I is a gpuArray, then no plot is displayed. imhist returns the histogram counts in ans and does not return the histogram bin locations. Display a histogram of the image. Since I is grayscale, by default the histogram will have 256 bins. Display the histogram of the data. Since the image is grayscale, imhist uses 256 bins by default. Create array of class uint16. Calculate histogram. Because imhist does not automatically display the plot of the histogram when run on a GPU, this example uses stem to plot the histogram. Grayscale image, specified as a numeric array of any dimension. To compute the histogram counts and bin locations using a GPU, specify I as a gpuArray that contains a numeric array. Number of bins, specified as a numeric scalar. If I is a grayscale image, then imhist uses a default value of 256 bins. If I is a binary image, then imhist uses two bins. Indexed image, specified as a numeric array of any dimension. Colormap associated with indexed image X, specified as a c-by-3 matrix. The colormap must be at least as long as the largest index in X.
Histogram counts, returned as a numeric array. If the histogram is computed for an indexed image, X, then the length of counts is the same as the length of the colormap, map. If the histogram is computed using a GPU, then counts is returned as a gpuArray containing a numeric array. Bin locations, returned as a numeric array. If the histogram is computed using a GPU, then binLocations is returned as a gpuArray containing a numeric array. To display the histogram from counts and binLocations, use the command stem(binLocations,counts). 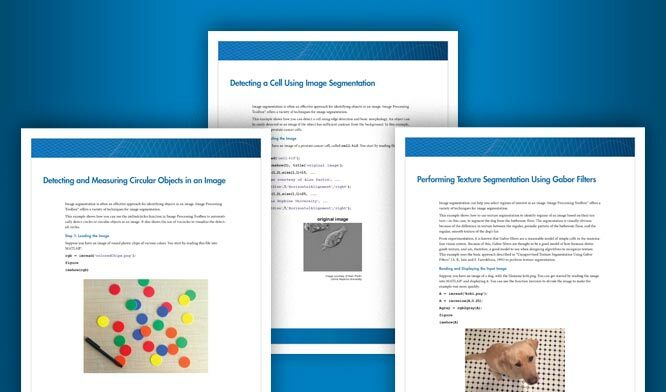 imhist supports the generation of C code (requires MATLAB® Coder™). Note that if you choose the generic MATLAB Host Computer target platform, imhist generates code that uses a precompiled, platform-specific shared library. Use of a shared library preserves performance optimizations but limits the target platforms for which code can be generated. For more information, see Code Generation Using a Shared Library. If the first input is a binary image, then n must be a scalar constant of value 2 at compile time. Nonprogrammatic syntaxes are not supported. For example, the syntax imhist(I), where imhist displays the histogram, is not supported. When running on a GPU, imhist does not display the histogram. 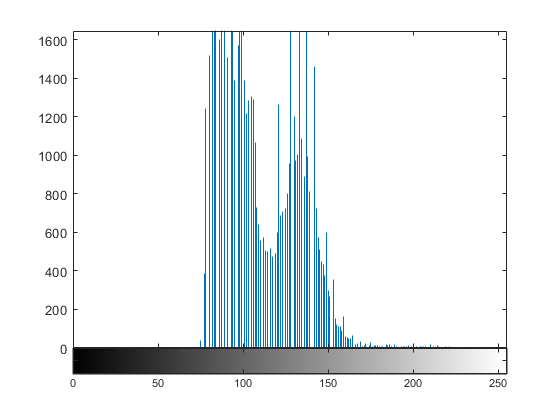 To display the histogram, use stem(binLocations,counts).